The Senior Connector program is a volunteer program offering resources and referrals to seniors, their families and caregivers. Senior Connectors empower others with knowledge to make informed decisions. Connections are made by senior volunteers through face to face contact with their peers in the communities where they live.In 2013 Volunteer Halton, a program of Community Development Halton, successfully completed a Senior Ambassador initiative, where senior volunteer leaders provided peer support promoting active aging through volunteerism. With input from the Senior Ambassador Advisory Committee and the Burlington Age-Friendly Council (BAFC) it was identified that there is a need for seniors and their families to understand and access current resources, information and services. Seniors endorsed the Senior Connector program as they strongly support the one-on-one exchange of information, services and programs that will enhance their quality of life. With Volunteer Halton as the lead, and Burlington Age Friendly Council as a collaborative partner, the development and implementation of the Senior Connector Program was created. Senior peer volunteers are educated and trained on information and services that are available in the region of Halton. 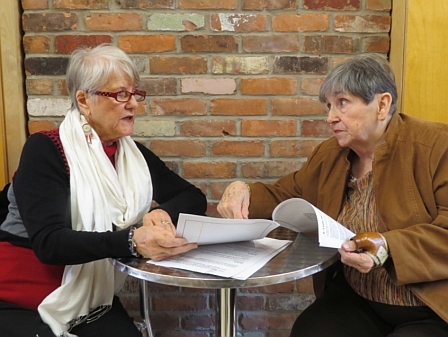 Upon completion of the training, volunteers are provided with placements where seniors congregate and/or reside, such as; community dinners, pharmacies, libraries, senior centres, faith groups, exercise programs and senior residences.Seniors Connectors have documented all inquiries that have been asked by their peers. The most significant resources and information requested include the following:1. Falls and safety2. Loneliness3. Caregiving4. End of life planning5. Transportation6. Housing7. Dental care8. Medication coverage9. Mental healthThe Senior Connectors have indicated this volunteer position has made an invaluable contribution to their health and well-being. Details on older people's involvement: Older adults contribute their skills and knowledge as volunteers, to the wider community. They provide valuable resources and information to their peers, family members and caregivers. They connect with older adults in locations where they reside and/or congregate. The Senior Connector provides a unique and worthy service in the region of Halton. Yes, we have positive feedback from the Senior volunteers and community. One of the challenges is the ongoing engagement of senior volunteers due to transition in life such as health or family circumstances. The goal is to continue to maintain and expand the program. We hope to sustain this program through leadership development of senior volunteers and core funding. The Senior Connector program has been a very rewarding and overall successful experience thus far. Although the majority of resources provided consists of hard copies (ex. brochures , guidebooks) of information, we recognize the importance and usefulness of being able to access resources through technology. In future, this will be an important consideration to enable seniors to access information using a variety of tools. It is recognized that there is a need for this service throughout the region of Halton, and the challenge is to meet the demand for the Senior Connector Program.